Stain Buddy is one of the world’s best stain remover. It is a powerful carpet cleaner and stain remover that is environmentally, human, and pet friendly. It works on some of the toughest stains that includes coffee, juice, red wine, oil, pet stains, and more. Plus it works without any rubbing and scrubbing needed. The unique formula in Stain Buddy does not leave behind any residue and does not attract dirt. It also eliminates odors and leaves a fresh citrus scent. Stain Buddy works in just seconds after spraying, the stains will disappear right before your eyes. The formula deep cleans beneath the surface and actually breaks the molucalr bonds between the stain and the surface. Stain Buddy is made in the USA and is completely non-toxic and non-flammable. It is 100% safe to use around your kids and pets. Right now with this current offer you’ll get 2 bottles of Stain Buddy for just $19.95 plus the cost of shipping and handling. This is normally a $51.90 value. As a special bonus, you’ll also receive a Blotting Rag absolutely free with your order. It works great with Stain Buddy. One Comment on "Stain Buddy"
I ordered this product few years ago from QVC. I love the product. I did exactly what the representative said. I have white carpeting and over the years my grandchildren have spilled just about everything that would stain. 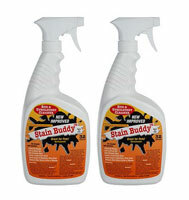 Stain Buddy removed every single stain put down, from chocolate, red wine, oil, grease, grass stains to pet urine. No other product delivered like the Stain Buddy. Where can I purchase more?